This specimen was found on a tapelift from a library at a Community Center. The head of the mite is facing upward to the left. Tarsonemus mites are rather small compared to many other mites found in homes. The main part of the body excluding the mouth parts, the idiosoma, in the female is typically over 100 micrometers long and clearly divided into a forward section, the proterosoma, that contains the first two pairs of legs and mouth parts, and a posterior section, the hysterosoma, that includes the last two pairs of legs. The female Tarsonemus mite can be distinguished from the male by its very thin fourth pair of legs that terminate in two long setae. Hallas, T. E. and J. Korsgaard, "Systematic variations in the appearance fo house-dust mites (Dermatophagoides spp. 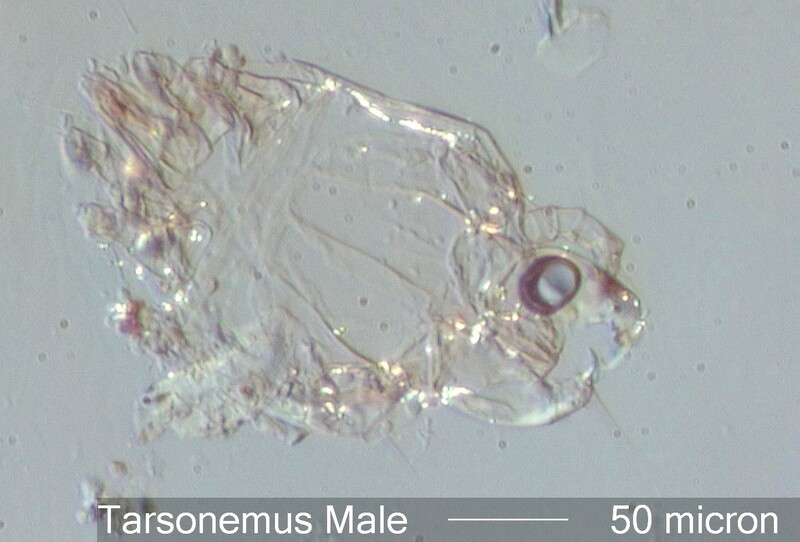 ), house mites (Glycyphagus domesticus), and of Tarsonemus sp. in dust samples from dwellings", REV. ESP. ALERGOL INMMUNOL CLIN. JUNIO, PP. 173-178, 1997.